Trump is hopping mad the EU for at least seven reasons. Mad enough to foolishly smack them with tariffs? I Believe so. MarketWatch reports Trump Threatens Europe With Tariffs and Vows Veto as Senate Rejects Border Emergency. Trump made his comments to reporters as he met with Irish Prime Minister Leo Varadkar in the Oval Office. Trump also said on Twitter he anticipated a “large scale” trade deal with the United Kingdom, which is facing a delayed exit from the European Union. Before the Senate voted on terminating Trump’s national emergency, he told reporters, “I’ll probably have to veto it,” and predicted his veto wouldn’t be overturned by Congress. The Senate passed its resolution 59-41, with 12 Republicans including Mitt Romney and Marco Rubio voting for it, prompting a one-word Trump tweet in response. The declaration is already the subject of a legal challenge. Trump has attempted to coax Republicans into voting his way on the issue and painted those who vote against him as standing with House Speaker Nancy Pelosi and for crime and open borders. Trump wants a trade deal that includes agriculture. The EU says no. Trump wants Germany to increase military spending, Germany has plans to cut military spending according to Eurointelligence. I do not know if Trump is aware of this yet. Discussion below. Trump wants Germany to scrap Nord Stream 2, a gas pipeline between Russia and the EU underneath the Baltic Sea. The EU sided with Germany. Trump wants the EU to buy US Liquid Natural Gas, but the EU instead will buy from Russia because its cheaper. This is part of the Nord Stream 2 issue. Trump wants the EU to abide by his sanctions on Iran. Instead, the EU created a mechanism in which European suppliers can trade with Iran in euros rather than dollars as a means to get around US sanctions. The mechanism is little used, if at all, but the idea infuriates Trump. EU tariffs on US cars are higher than US tariffs on EU cars. US tariffs on EU SUVs and Trucks are way higher than EU tariffs on US trucks and SUVs but that doesn't matter. Trump does not want Germany to use 5G technology from China's Huawei. Germany said it will go ahead. It is almost forced to. The reason is Germany is far behind the US. Its 4G technology is made by Huawei. My understanding is that there is compatibility between 4G and 5G if the vendor is the same. Thus, Trump's demand could set back Germany a couple of years. Spiegel Online has a terrific story that Olaf Scholz is torpedoing the planned increased in the German defence budget. Germany is spending only a meagre 1.2% of GDP on defence. Ursula von der Leyen, defence minister, recently proposed an increase in the defence budget to 1.5% by 2023, which would at least show minimal convergence towards the Nato spending target of 2%. But Olaf Scholz, her arch-enemy in the cabinet, is promising a mere €3bn increase, cumulatively over four years. This would leave the defence spending quota effectively unchanged. Since the inflation rate for defence equipment is above the average inflation rate, Spiegel notes that this constitutes a de facto cut in military expenditures. I picked up the above from Eurointelligence. The article is in German. 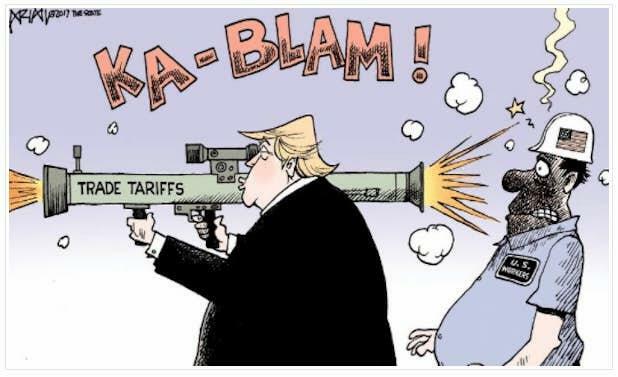 One of the reasons Trump is anxious to close a deal with China is so he can blast the EU with a massive dose of Tariffs. I do not think he wants two simultaneous trade wars. This is another reason to expect Trump to not demand too much from China in a deal. Should Trump rule that EU cars are a threat to US security, as he has threatened to do, the EU will retaliate strongly. The end result would be an instant global recession. We are on the cusp of one anyway.